This weekend was pretty busy – but all good things! And I was thrilled to get in a mix of both mountain and Front Range activities. When I left my downtown office on Friday, I walked out into a blur of snowflakes – the perfect setup for the night I had ahead. 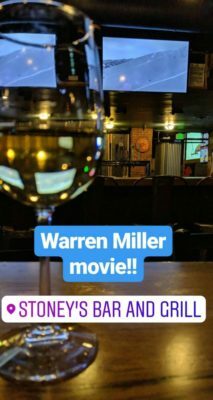 My friend Chris and I were going to a screening of a Warren Miller ski film at Stoney’s, a gigantic sports bar in Denver. Although it was packed when I walked in, Chris had scored us seats in a section that didn’t end up opening – so we had our own private room for the screening! An entire room of the bar, all to ourselves! Speaking of skiing, I woke up super early on Saturday morning in order to get up to the mountains. Although I wasn’t originally planning to ski this weekend, a former client from Dallas was in town to visit friends, and I told him I’d meet him for a few runs at Keystone. However, while I told him to make sure to leave early because of the traffic, he thought that meant 7:30am. Nope – that’s prime time! I left at 5:30am and made it in about two hours (some traffic, but mostly light); by leaving at 7:30am, poor Rob didn’t make it to Keystone till 11:30am. No fun! I had another friend skiing Keystone that morning too, though, so after I finished my breakfast at Inxpot, Justin and his friend Michelle joined me to ski till Rob arrived. All three of us turned out to be similar ability levels, which was great, and I was sorry I couldn’t ski with them longer. But Justin and I made plans to ski this weekend in Vail, which I’m excited about! After I split off from Justin and Michelle, I headed to the base to meet Rob and his friends, and help them out with buddy passes so they wouldn’t have to pay the window prices for tickets. Then, we hopped on the lifts and made our way to the top! Rob and his roommate live in Texas and hadn’t skied for a few years, but they ended up remembering their old skills fast, and being much better than I expected given how they downplayed their abilities. It’s nice that skiing comes back to you so quickly even after a long break! Unfortunately, I couldn’t stick around too much longer – I had already been skiing a while, and I was getting cold. I had just bought new boots this week that have Bluetooth heaters in them, but I hadn’t yet had my skis adjusted to the boots, so Saturday was my last day in my old boots. Good riddance! I’m really hoping the new boots help me ski longer without getting cold. On my way home from Keystone, I made a quick stop at the boot fitters so I’m all set with my new boots for next time, then ran a few errands for groceries and such. And once I got home, it was time to finally take down all my Christmas decorations and get them put away. 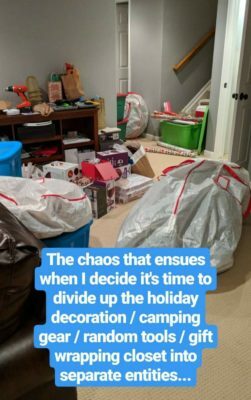 While doing so, I decided to clean out my basement closet that houses holiday decorations AND outdoor gear AND gift wrapping stuff, and instead designate a different closet for each of those things. It felt great to get organized! While I’m not quite going on the Marie Kondo kick that I know is taking over America for New Year’s, I think I want to commit at least one hour a week to organizing / cleaning out stuff, in hopes of simplifying at least a little bit. To keep this real, here’s a picture of my mess. Yikes! Although organizing may seem like a lame Saturday night, I really needed the downtime… my Sunday was packed! I kicked it off with a visit to Chuze Fitness, then hustled home for a meeting I was hosting with a few residents to discuss our Town communication strategy. The meeting was really productive, and we shared a lot of great ideas – I’m looking forward to making some new things happen! 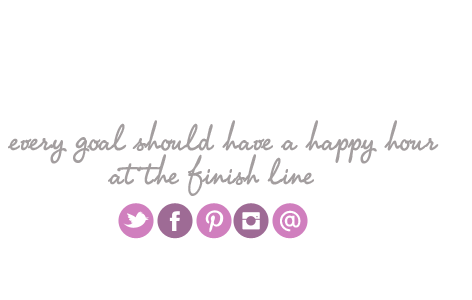 Next up: cookblog club. This month, we were cooking from Detoxinista, and I chose to make dessert: raw “cheesecake” truffles (made from cashews). These were mostly really easy to make: blend all the ingredients in a food processor and freeze the resulting pudding so it solidifies. The next step was a bit tricky though: take the frozen pudding and scoop it into balls with an ice cream scoop. Rolling the balls ended up melting the nut butter all over my hands, which was pretty messy! But the balls came out absolutely delicious, so I would still recommend this recipe. At Cookblog Club, we talked about possibly just freezing them in a round ice cube tray (like this? ), which would then make the recipe super simple and foolproof. 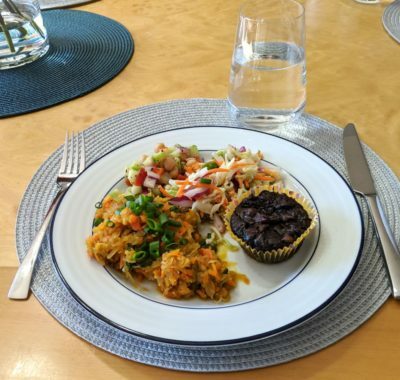 The rest of the recipes were awesome – Karlin made this veggie chow mein, Helene made a chickpea salad, and Cathryn made a sweet sesame-lime cabbage salad, and Elisabeth made flourless zucchini chocolate muffins. Although everything was delicious, my favorite was Cathryn’s slaw – the flavor was so fresh and bright, and I went back for thirds. That recipe is definitely a keeper! Here’s a plate of everything except my cheesecake balls… we kept those in the freezer until we were ready to eat them. After cookblog club, I headed straight downtown to meet up with my friends Hillary and Chad, who I hadn’t seen in almost a year. They not-so-recently had a baby who’s now 8 months old, and I hadn’t even met him yet! I’m a terrible friend. But my friends Kelly and Den joined me to meet Mason, as they hadn’t met him either, which made me feel a tad bit better. Hillary and Chad seemed to be doing fantastically, and they said they’re now at a point where they’re starting to socialize a bit more, so I hope to hang out with them more often going forward! Finally, I wrapped up my Sunday with dinner and a play. I had gotten tickets to A Bronx Tale for my friend Kevin for Christmas, and before heading to the theater, we first enjoyed a theme-appropriate meal at Gaetano’s, a 70-year old Italian restaurant that was founded by a mob family in the 1930s. The pasta dinner was yummy and the perfect comfort food, and it set the scene perfectly for the show. I have to confess, I didn’t love A Bronx Tale the way I thought I would from the hit Broadway reviews. It felt a little bit cheesy to me, which was disappointing, but as I hadn’t seen the movie before, the plot still took me by surprised. (And I totally gasped when there was a crucial death at the end of the show.) Regardless, I’m still glad I got to see it! I haven’t been going to the theater very much since moving to Denver, but I’m starting to try to change that in 2019. Goal is to see at least one show a month – both for the enjoyment, and also to do my part in supporting the arts :) We’ll see how that resolution goes.